Day 4 of the Holiday Card Series 2018. The series consists of 25 holiday card videos on Monday, Wednesday, and Friday of each week until November 30. 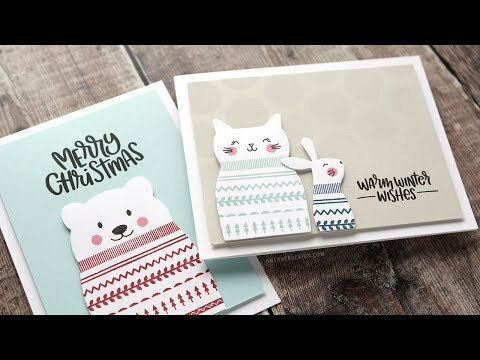 For Day 4, and I created a bunch of cards using the new Critter Sweaters stamp set and coordinating dies from Simon Says Stamp. Below are links to the items shown in the video. Compensated affiliate links used when possible. Items marked with an asterisk (*) were provided by a store or the manufacturer. All other items were personally purchased. Items below are shown in the order they appear in the video, with most visible products shown first. Some product is provided by manufacturers for review and use. Compensated affiliate links used where possible.